These Game Day Cookies take all of your favorite game day snacks and incorporate them into a cookie. What are the ingredients in these game day cookies? There are mini pretzels, which you break up by hand, but not too much. Don't crush them because you want actual pieces of pretzels in these cookies. There are also potato chips, but not just any potato chips. Use salted kettle-cooked potato chips and break them up by hand as well so that you have pieces, not crumbs. 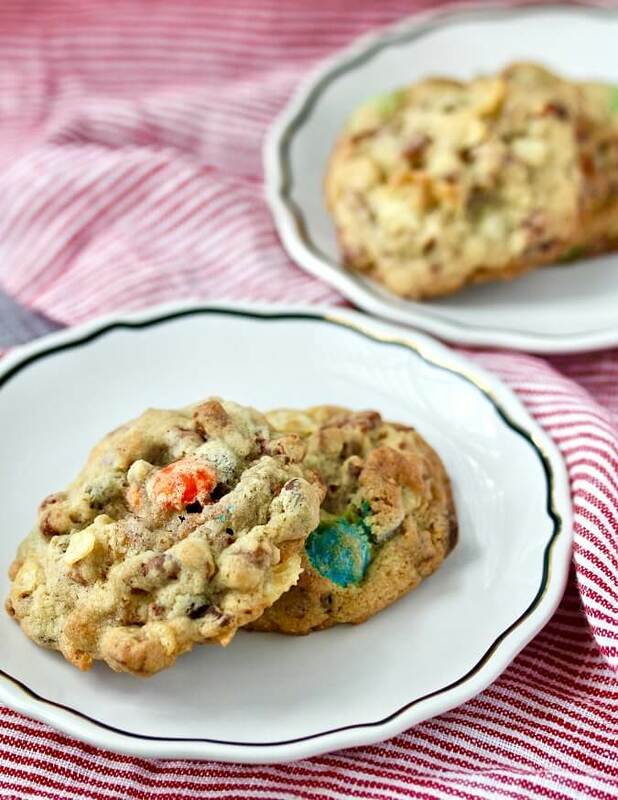 For sweetness, there are M&Ms and chocolate chips. While I used regular M&Ms, if you can find the mini ones, try them as they may be less likely to bleed the color onto the cookie. Next up, candied bacon. Candied Bacon! Make a little extra for snacking while you are assembling the cookies. These cookies are pretty easy to make. You don't even need to chill the dough! To portion the dough, I used this #30 scoop. Size 30 means that it holds about 2 1/8 tablespoons of dough, so if you add a heaping amount of dough to each scoop, you will end up with the right size. Another option for getting the right sized cookies is to form the dough into a log and cut it into 24 even pieces, and then shape them into balls with your hands. This month, the Creative Cookie Exchange theme is Your Favorite Cookie. Clearly, with all of the cookies I've already posted here, it would be hard to now post my favorite cookie. After all, I have 139 cookie recipes on this blog! If I picked one, all of the other cookies would be jealous. When my kids were little, they used to ask me which one was my favorite. Because I have a girl and a boy, my standard answer was "you're my favorite girl!" or "you're my favorite boy!" They would roll their eyes at me. 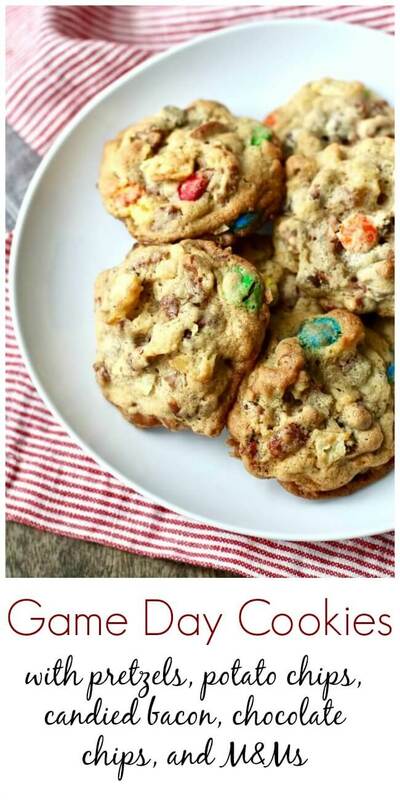 Let's just say that these are my "favorite watching a football game with friends or tailgating" cookies! Browned Butter Chocolate Chip, Caramel, and Sea Salt Cookies: These take chocolate chip cookie to a whole new level. Chocolate Andes Mints Chips Cookies: These are delicious, plus, my grandson totally fell in love with them and requested that I make them for him to take to a class cookie exchange. Chocolate Peanut Butter Chip Cookies: It may be because the peanut butter chips in these cookies were out of this world. Cornmeal Sablés: These sweet corn cookies were melt-in-your mouth crumbly, just like sablés should be. Foolproof Holiday Cookies: These cookies are easy peasy and so delicious! Vanilla and Chocolate Rocks: These things are basically chocolate chunks held together with just a little bit of vanilla dough. I've literally seen people who never swoon actually swoon over these. Levain Bakery Dark Chocolate Chocolate Chip Cookies: These cookies are huge, gooey, and ooze chocolate all over the place. Heart of Darkness Brownies: I posted these six years ago, when I first started this food blog, and I need to make these again. Chocolate and marshmallow topped with caramel. Sticky, gooey, and delicious. If you make any of these, be sure to post them on Instagram and tag me at @karenskitchenstories. I would luuurve it if you gave me a follow too. Before the recipe, here are my fellow cookie bakers favorite cookies! Heat the oven to 350 degrees F and line two baking sheets with parchment paper. Fry the bacon in a medium skillet over medium low heat until crispy. Drain off and save the drippings in a small bowl. Keep the bacon in the skillet. Add 2 teaspoons of brown sugar and the water to the skillet and cook with the bacon, stirring constantly for one minute. Transfer the bacon to a plate and make sure to spread out and separate the pieces. In medium bowl, whisk together the flour, baking powder, baking soda, and salt. In the bowl of a stand mixer, beat the butter, 2 tablespoons of the bacon drippings, 1/2 cup of brown sugar and 1/2 cup granulated sugar on medium high until pale and fluffy. Add the egg, egg yolk, and vanilla and beat until well combined. Reduce the mixer speed to low and add the flour mixture. Mix until just combined. 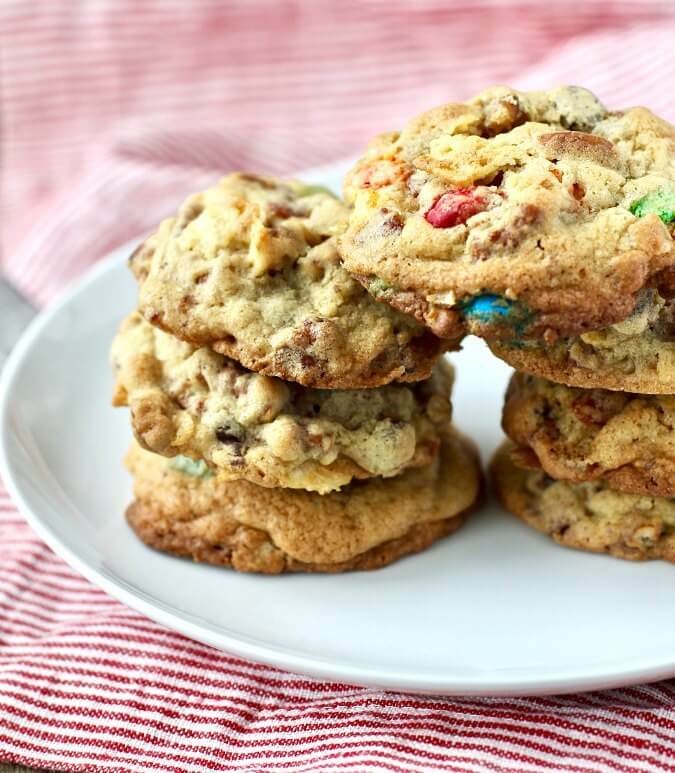 Add the pretzels, chocolate chips, M&Ms, and bacon and mix on low until just combined. With a rubber spatula, stir in the potato chips. Roll the dough into 3 tablespoon balls and place them 2 inches apart on 2 parchment lined baking sheets, 12 per baking sheet. Bake the cookies, one sheet at a time, for 13 to 15 minutes. The cookies should be set on the edges and soft in the middle. Cool the cookies on the baking sheet on a wire rack for five minutes. Move the cookies from the baking sheet to a wire rack to cool completely. This Recipe was adapted from The Food Network Magazine, Volume 12, No. 1, January/February 2019. You can use us as a great resource for cookie recipes. Be sure to check out our Pinterest Board and our monthly posts (you can find all of them here at The Spiced Life). You will be able to find them the first Tuesday after the 15th of each month! If you are a blogger and want to join in the fun, contact Laura at thespicedlife AT gmail DOT com and she will get you added to our Facebook group, where we discuss our cookies and share links. What is your favorite cookie? I'd love to know. These sound like what I think of as a kitchen sink cookie--which I think are amazing. I have never tried the candied bacon, which clearly needs to be rectified. Next time! It kind of is a kitchen sink cookie! Next time I might just add more bacon.